Depending on which versions of the six different movies you have experienced over the years, Peter Jackson has now invited us to spend somewhere between 17 hours and 463 years in Middle Earth. If you watched them back to back to back to back to back to back, you couldn't, because the human life span doesn't permit it. All right, we've had our little fun at the expense of Mr. Jackson's propensity for narrative sprawl, because it's almost mandatory—like chuckling at J.J. Abrams' lens flares or James Cameron's tin-eared dialogue. But it's also an expression of frustration at the way he seems to have lost sight of the fine line between epic and "enough already." Or maybe it's sadness that, as much as we wanted The Hobbit films to allow us to repeat the experience of The Lord of the Rings, they really should have been something quite different. Yet here we now are, having reached the point where Tolkien's (relatively) slim volume, split into three movies, at last reaches its conclusion. And it's hard to extract oneself from a theater seat for The Battle of the Five Armies with a primary emotion that is anything other than relief. Jackson leaps in right where The Desolation of Smaug ended, hoping we care enough to keep up with where all of the characters were, and why. The dwarf party has been split, with several members—plus Bilbo Baggins (Martin Freeman)—at the Lonely Mountain, while others face the wrath of the dragon Smaug (Benedict Cumberbatch) in Laketown. 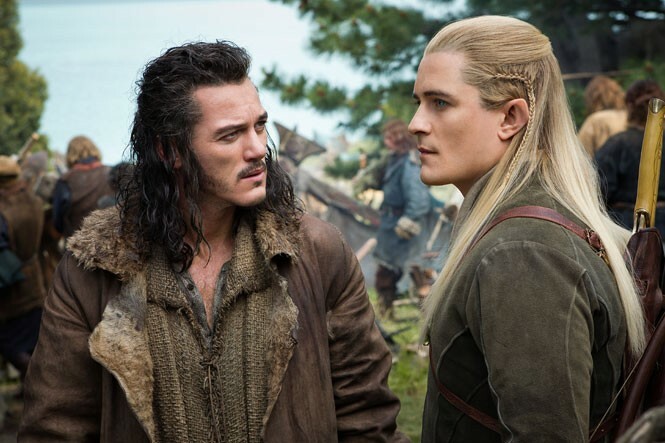 But even once the archer Bard (Luke Evans) manages to defeat Smaug, there seems to be little hope for peace. Dwarf leader Thorin (Richard Armitage) is determined to keep the entirety of the mountain and its treasures once guarded by Smaug for himself, even as armies of elves, men and orcs congregate, each with their own interest in capturing the stronghold. All-out cast-of-digital-thousands warfare ensues, and there's no question that this is a scale on which Jackson knows how to operate. He's a gifted choreographer of what, in most other hands, would be distractingly edited chaos, and some of his individual moments in those battle sequences are terrific. It's delightful watching Legolas (Orlando Bloom) somehow tiptoe his way to safety up a cascade of falling debris, and Jackson knows when to shift from meleé carnage to life-or-death individual confrontations, like Thorin's showdown with the blade-armed orc chieftain Azog. Those are the moments when The Hobbit movies have teased us with the combination of playfulness and majesty that made The Lord of the Rings films so indelible. But Jackson's insistence upon going big with this story—building in every possible connection between this one simple adventure and the fate-of-the-world stakes of The Lord of the Rings—means there are too many loose ends to tie up here. Bilbo—still charmingly portrayed by Freeman—disappears for huge stretches as Jackson works to resolve situations like the manufactured romance between elf maiden Tauriel (Evangeline Lilly) and handsome dwarf Kili (Aidan Turner), or the rescue of Gandalf (Ian McKellen) from a squadron of ghost warriors by Saruman (Christopher Lee) and Galadriel (Cate Blanchett). The emotional extremes—from the operatic moments of tragedy to the forced comic-relief of the craven, greedy Laketown minister Alfrid (Ryan Gage)—make it feel like Jackson is working from a checklist: "You'll laugh! You'll cry! You'll gasp!" And you'll check your watch. Astonishingly, Five Armies is the shortest of the six Middle Earth films, clocking in at just under 2 1/2 hours, yet there's still a redundancy to virtually everything the movie counts on to connect with an audience. The centerpiece battle is a mashup of the more compelling sequences in The Two Towers and Return of the King; Thorin's descent into power-mad violence echoes the fate of Boromir in The Fellowship of the Ring; etc. By the time Bilbo returns home to The Shire, where his possessions are being sold because he's been presumed dead, it's not just a reminder of how long this quest has dragged on. It's a reminder of the goofy, whimsical side that Jackson generally ignored in favor of more LOTR copycatting. The final shot of old Bilbo (Ian Holm) being visited by Gandalf feels less like a linking piece than a threat: My God, this truly will never end.